Make yourself comfortable in one of our European Touch Pedi Spa Chairs, designed to enhance your treatment with massage, heat and recline options. All of the House of Beauty Pedicures include gentle filing to smooth away any hard skin or tissue build up, then the legs and feet are scrubbed and exfoliated to leave the skin feeling silky soft and smooth. Cuticle work, nail shortening and shaping prepares your toes nails for your chosen polish, but not before your feet and legs are treated to a muscle relieving massage. All of the Pedicures at House of Beauty are a Luxury Treatment, but we recommend a Callus Peel every third to forth Pedicure for maintenance and keeping the heels and areas prone to hard skin at bay. For extreme cracked heels and callus feet problems, a Callus Peel Pedicure is an essential treatment and may need 2-3 sessions to restore the feet to soft, pink and perfect. Treat yourself as well as your feet and take advantage of House of Beauty having an alcohol licence full café menu…from a Cappuccino to a glass of Champagne, a piece of delicious cake to a light lunch, House of Beauty can enhance your visit . 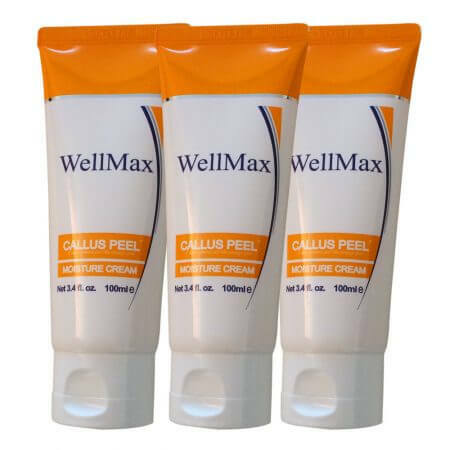 A foot cream used nightly will always keep your feet feeling soft, but Wellmax Professional Callus Peel Moisture cream will keep the feet soft and callus free, especially around the toe nail area that can sometimes feel uncomfortable if the nails are not trimmed straight. Curving your toe nail will encourage the nail to in grow and the skin to build either side to the nail and if you are a runner, keeping your toe nails as short as possible is essential to avoid nail lifts. Wellmax Cream – £12.99 available at House of Beauty.